Emily's Recipes and Reviews | UK Food Blog | Leicestershire : sushi: how britain became addicted to raw fish. sushi: how britain became addicted to raw fish. Cast your mind to a breezy, summer afternoon. Feeling a little peckish, you stumble into your trusty local supermarket and begin to rummage through your pockets for loose change. Your eyes dart towards a sign which reads ‘Food to go.’ Hastily, you dodge your way past a googly-eyed toddler absentmindedly devouring a precarious 99 flake and make a beeline for £3 lunch-time heaven. You hear a distant voice ask ‘Are you using your own bags?’ as you skim the inviting shelves. Granary, oatmeal, wholemeal. Cob, bap, roll. Extra cheese, no mayonnaise, with cracked black pepper. A rainbow row of crisp packets fighting for your attention amidst stacks of granola and fruit medleys. As you reach for a trusty BLT and check your selections add up to the all important ‘meal deal’, you notice something a little different. Rice? Seaweed? Wasabi? They definitely don’t come with a wholemeal option. And California roll, wasn’t that a song in the sixties? Yet a few months later, you discover yourself swapping plastic forks for chopsticks and keeping a spare bottle of soy sauce in your car glove box just in case. And so this is how Britain became addicted to raw fish. As crates of pre-packed sushi find themselves in garage forecourts and sushi plates are thrown onto conveyor belts, the slithers of salmon placed upon perfect parcels of sticky rice are more popular than ever. Farewell to the suave snack between million pound Japanese business deals. Now sushi bars can even be found at Butlins resorts, between the fish and chip shops and candy floss vans. 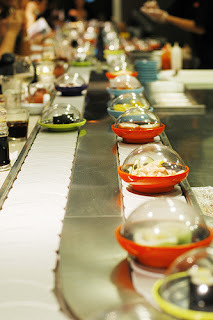 On a recent survey, 60% of 16-25 year olds admitted they’d like their own personal sushi belt. Is sushi becoming the new chicken tikka masala? And it’s true. It must go without saying, the comparison is rather like having the choice between a pre-made meatball sandwich and a freshly cut and panfried steak. Minus the cooking of course. But in this self-serve century we find ourselves in, we must cater for the masses, and quick. There is no way a supermarket could cater for requests of a freshly sliced yellowfin tuna and salmon roe selection. And why should they? When we’re happily munching on, essentially, rolled up tinned tuna, seafood sticks and fish-shaped bottles of soy sauce. The label proudly beaming ‘Not raw fish’ for us Brits to see. There’s no doubt some sushi lovers could be getting a raw deal. Another worry is the celebrity get-fit-quick culture which sushi seems to have lent itself too. With actresses Reese Witherspoon and Jennifer Aniston, model Lauren Conrad and even British actor Andrew Garfield hailing sushi as the new slim fix, there’s no wonder the dinky delights dance their way into the latest gossip magazines. 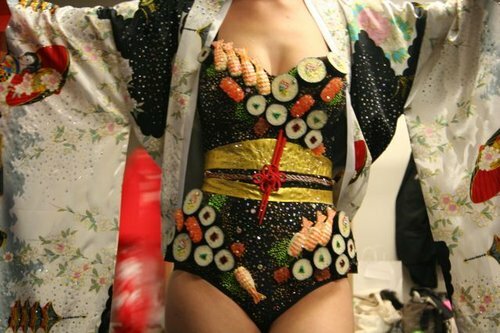 Katy Perry took this part quite literally in this rather fantastic sushi ensemble. No fear, certainly a couple of harmless plates of sushi and a few sips of saki would ever be akin to a night on the town with that essential kebab and chips. Well, what could be healthier than seafood, iron-packed seaweed and a bit of rice? But like all things, moderation is the key; sushi can be lumbered with calories and extremely high in salt. A single California roll, a Western favourite, can easily contain 400 calories and 5g of salt. Pretty shocking when a serving of McDonalds fries has around 450 calories. 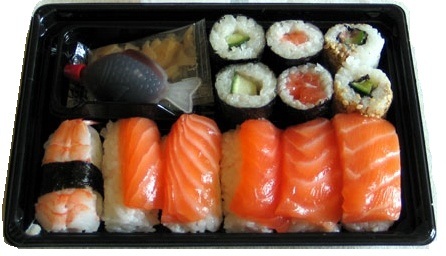 Salmon and tuna sushi in particular is often saluted for its high levels of Omega three fats. However the Food Standards Agency urges consumers that high levels of mercury found in these types of fish can be toxic and can build up in the body if overeaten. Another thing, those of you who screwed up their face at the idea of raw fish and feared seafood poisoning, will be pleased to know you can munch on the likes of hoisin duck noodles, chicken katsu curry and crispy prawn tempura. But there's no stopping me... sushi lovers unite! Now, where are my chopsticks? Oh my god the Sushi Awards?! Sounds like heaven! The perfect lunchtime snack, or any time really haha. It was amazing! Not that hard to get a press pass either :) In 2011 it was in July but seems this year it was in February so I've missed it :( The winning sushi chef gets a giant soy sauce bottle trophy haha. the crowded house, ashby de la zouch. the bay tree, melbourne derbyshire. chocolate macarons: a recipe in pictures.